On behalf of the race organizing team, I would like to openly welcome entrants and supporters to the annual Burton Leonard 10K and 3K junior races. We are delighted that the 2018 event is proudly sponsored again by the refreshing local business, Grass Roots of Harrogate. Both race routes sample the natural rural terrain of the pretty landscape which surrounds our picturesque village. For 33 years, the event has famously attracted a complimentary mix of club runners and leisure runners from across the region. We organize our race plan with a culture of constant review and continuous improvement. Our goals are simple; To deliver an excellent race experience together with the safety of competitors, officials, and spectators. Recent tweaks over the last few years have produced well organized and suitably challenging courses. The start and finish area are located within the Burton Leonard Primary School grounds - allowing a great location for our finishing arch and plenty of space for warming up and spectators. Registration - The HQ, inside the school, will be open from 09.00am. To register, just visit the desk to collect your race number & timing chip. Race Number - You must complete the personal details form on the reverse of the number. Your race number must be worn on the front (pins will be available at HQ). Do not deface or fold the number. Do not swap numbers or timing chips with anyone. Timing Chip - Collect your timing chip tag with your race number. Follow the fitting instructions. The tags are re-useable and must be removed and returned at the finish area. If the tag is not fitted, your time will not be recorded. If you collect a timing tag on the day but then decide not to run, please return it to race HQ. Race Briefing - On the start line, 5-10 minutes before the start. Directions - For sat-nav, use the Race HQ postcode HG3 3SJ. Please arrive in good time. The village gets busy. Allow yourself time to park, register, change, study the start/finish area and warm up etc. Parking - There will be 2 car parks. The main car park is on Peter Lane, off the main village road. There will be an overflow area located in the Hymas haulage yard at the bottom of the village. Please follow the signs and steward's instructions. 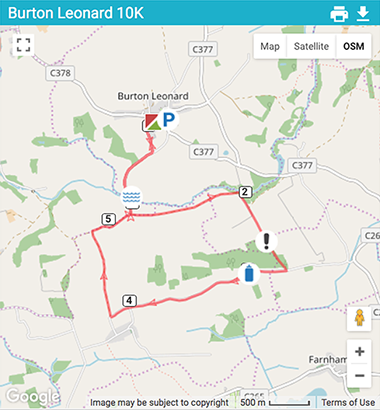 How was Burton Leonard 10k?